After a long musical career in New Jersey, I am starting to find my niche here. One of my favorite recent gigs was at VillageWalk, the community where we live. I had the pleasure of playing the piano and singing my favorite songs, mostly from the Great American Songbook. My audience was very appreciative and enthusiastic. What could be better? I have also become busy performing at local retirement communities, such as Aviva, Sarasota Bay Club, and Overture Grand Oaks. The residents appreciate the great tunes from Broadway and beyond. Life is good in Sarasota. It was May 22, 2012, at Town Hall in New York City. The event was a memorial concert remembering and honoring Donald Smith. 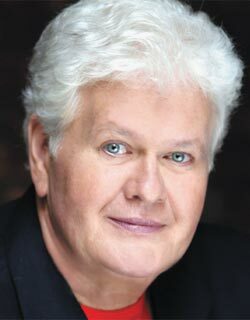 If you’ve been to the Mabel Mercer Cabaret Convention, you have Donald Smith to thank. He founded the organization decades ago. Every year he gathered dozens of talented singers to entertain us. He also discovered, and nurtered the careers of, many notable singers, including Michael Feinstein and Andrea Marcovicci. In addition, Donald was responsible for reopening the Oak Room at the Algonquin Hotel in 1980 (which has, sadly and ironically, just closed). 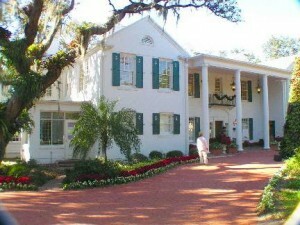 In 1976, he helped preserve Town Hall by having it declared an historic landmark. The memorial concert was memorable and inspiring. In addition to the aforementioned Feinstein and Marcovicci, the roster of signers also included Ann Hampton Callaway, Barbara Carroll, Marilyn Maye, Steve Ross, Billy Streitch, KT Sullivan, and Ronny Whyte. They, and many others, shared intimate stores and memories of Donald Smith. This was truly a night to remember! Is “The Way We Were” a favorite song of yours? How about “It Might Be You“, the theme from the movie “Tootsie”? Did you like the songs Barbra Streisand sang in “Yentl“? Do you remember the theme songs to the TV shows “Maude” and “Good Times“? What all these songs have in common is that their lyrics were written by Alan and Marilyn Bergman. It’s unusual for a husband and wife to work together so successfully. What’s even more unusual is that they’ve been doing it for over 50 years!! As a New Jersey pianist and singer, I know that the songs I choose to sing have to move me and speak to me on an emotional level. So many of the Bergmans’ lyrics do just that. They’re clever, witty, and sophisticated, and they often remind me of the lyrics of Ira Gershwin and Cole Porter. I hope you’ll be inspired to listen to the lyrics I have linked to. Please let me know what you think. Enjoy! Have you heard Ronny Whyte? Have you ever been to Shanghai Jazz Restaurant in Madison, New Jersey? Do you know about the New Jersey Jazz Society? These three wonderful treasures recently came together for a truly memorable and enjoyable afternoon. In addition to hearing his fabulous music, we also learned some interesting things about him. For example, Ronny performed in “Our Sinatra.” He was good friends with Bobby Short and Mabel Mercer. He wrote the lyrics for a song recorded by Tony Bennett, “Forget the Woman” as well as a companion song to “As Time Goes By” made famous in the movie Casablanca. It’s called “Here’s Lookin’ at You.” To show his versatility, he also wrote a satirical song called “Hampton Blues.” You can hear a sample of these songs here. 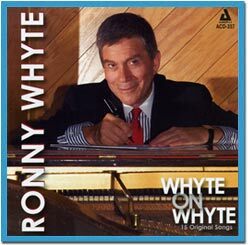 If you’re a jazz lover, you should check out Ronny Whyte’s CD’s or see him perform. For more information, see his website. And if you live in the area, consider joining the New Jersey Jazz Society. It’s always great to get away from the cold and snow of winter. So for the last few years, my husband and I have taken a short vacation to Sarasota on Florida’s west coast. 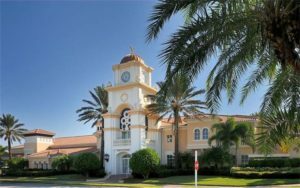 In addition to the obvious reasons (warmth, sunshine, magnificent Siesta Key beaches) Sarasota is also a cultural mecca – theater, the Ringling Museum of Art, the Selby Botanical Gardens, and great music. In fact, the musical scene runs the gamut from classical to pop and jazz. One of the highlights of this trip was getting to hear a cocktail pianist at Michael’s on East, a very popular Sarasota restaurant. Since I play and sing at a New Jersey restaurant, it was a treat to listen to another musician do the same. I even got to sing “La Vie en Rose” (en francais) while the pianist accompanied me! “What’s your favorite song?” That’s a question I ask very often. Whether I’m playing the piano and singing at a New Jersey private home, restaurant or country club, I love doing requests. And I know people appreciate being asked. Many people don’t have a favorite song, or else they need time to think of one. Others have so many that I need to write them all down! I often need to learn a new song if it’s requested, and I don’t know it. This was the case with Leonard Cohen’s “Hallelujah,” requested by a couple. By the way, I sometimes don’t remember people’s names, but I always remember their favorite songs! So many people come up and thank me for playing their favorite songs. I know they appreciate the gesture, and I get great satisfaction from knowing I’ve made them happy. So…..what IS your favorite song? I’d love to know! 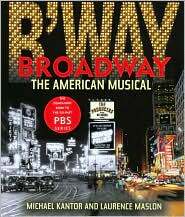 And by the way, mine is “Someone to Watch Over Me” written by the Gershwins in 1926. 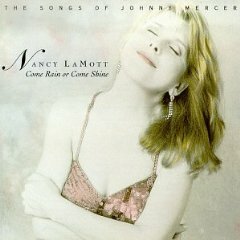 If you’ve followed vocalists over the years, you may have heard of Nancy LaMott. And if you listen to Jonathan Schwartz’s weekend radio program on WNYC in New York or on Sirius XM radio, you know that the very last song of each program is sung by Nancy. Listening to her is always an emotional experience for me. Even though I’ve heard a song interpreted by numerous vocalists, it’s always Nancy’s version that I find the definitive one. When Nancy sings the lyrics, it’s as if I’m really hearing them for the first time. She gave everything she had to a song, both musically and emotionally; she held nothing back. Another reason to feel emotional about Nancy is that she died at age 43, in 1995, when she was just starting to “make it.” Her last CD was recorded live at Tavern on the Green in New York City, just three weeks before her death. “Come Rain or Come Shine: Songs of Johnny Mercer” is a particularly notable CD. It’s very timely now because all year we’ve been celebrating the centennial of Mercer’s birth. And the combination of incredible vocals and instrumentals makes this CD especially worthwhile. Listen to “Talk to Me Baby” and “When October Goes”, and you hear vocal/instrumental duets! I must mention two very important men in Nancy’s musical life. Christopher Marlowe was Nancy’s piano accompanist and arranger. What a perfect duo they made! And David Friedman was crucial on so many levels to Nancy’s career. First of all, he produced all of her CDs; it was David who originally convinced Nancy to record her music. In addition, many of her most famous songs were written by David: “Listen to My Heart”, “We Live on Borrowed Time”, and “I’ll Be Here with You.” Finally, in 2007 David produced a two-disc CD, “Ask Me Again,” which is a compilation of her memorable songs. Many of the songs on this CD were recorded in Atlantic City, New Jersey. David has truly kept Nancy’s music alive. If you know Nancy and her music, you’ll understand my passion for her. And if you haven’t yet heard her, I hope this will tempt you. To hear some of Nancy’s songs, go to my YouTube channel, and click on the samples. Montclair, New Jersey is a special town, not a typical suburb. 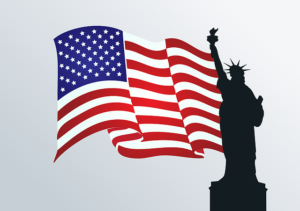 It’s ethnically and culturally diverse, with many great restaurants and theaters, and also Montclair State University. Another major cultural institution is the Montclair Art Museum, which is devoted to American Art, including Native American artforms. Currently (until January 3, 2010) the museum’s “Cézanne and American Modernism,” is an impressive exhibit with 131 works, including 18 significant pieces by the French master that cover a thirty year period of his career. 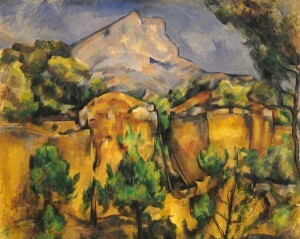 It examines Cézanne’s influence on a diverse group of American artists. Ten years in the making, the exhibit was organized by the Montclair Art Museum and The Baltimore Museum of Art, which will have the display from February 14, 2010, through May 23, 2010. It will then travel to the Phoenix Art Museum, where it will be on view from July 3, 2010, through Septermber 26, 2010. Last month, I had the pleasure of playing and singing at the museum for a soiree organized by friends at Bnai Keshet, a local synagogue. The gala fundraiser began with a private lecture and slide show, followed by a tour of the exhibit gallery. Afterwards, attendees enjoyed French wine and hors d’oeuvres while I entertained on the grand piano. Naturally I played and sang French songs, as well as American standards. Following my music, the audience was treated to a lively performance by “The Loose Canons,” singing in a wide range of styles, including political satire, Doo Wop, and folk music. It was a rousing performance which capped off a wonderful evening! To view a video, produced by Reuben Meltzer, of my performance at this event, click here. In a previous post, I mentioned that for one New Jersey Christmas party I play the piano for the “Hallelujah Chorus” from Handel’s “Messiah.” The guests sing it in four-part harmony, and the results are thrilling. You can hear a discussion of why this piece of music is so brilliant at the NPR program Performance Today. 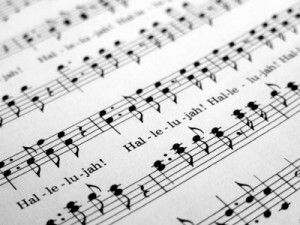 Composer-conductor Rob Kapilow analyzes the “Hallelujah Chorus” to explain why the “Hallelujah Chorus” works so well. Going over it note by note, Kapilow explains how the musical simplicity builds and builds to yield an extremely powerful whole. At the end of the eight minute segment you can hear a wonderful performance by the Monteverdi Choir and the English Baroque Soloists, conducted by John Eliot Gardiner. If you want to skip the discussion and go right to the music, click here.